Last spring I was introduced to agretti - an italian veggie with a very short season. Agretti, with its slender chive-shaped leaves, is considered a delicacy and its appearance in the market is always greeted with excitement. Agretti, roots and all, comes wrapped in paper - clean and trim before using. I began to cook with it last spring (see link at the end of this post to read last spring’s post). Experimenting was fun, but before I knew it the agretti season was over. Since I’ve now waited a whole year for agretti season to roll around again, I was quite excited when I found the first agretti of the spring at my local ortofrutta (small fruit and vegetable market) recently. I first cooked it as a side dish, a simple sauté in olive oil and garlic finished with a squeeze of lemon and a pinch of salt. This is a classic preparation, no recipe needed. Next, I decided to try agretti in a pasta dish. I proceeded without a recipe, combining flavors that are classically paired with agretti - lemon juice and olive oil - along with ingredients I had on hand, including pancetta, Parmigiano Reggiano cheese, and penne pasta. The dish tasted bright and lemony, just like spring. I will definitely make this dish again and, if you come across agretti in your local farmer’s market, I hope you will be inspired to try it as well. Bring a large pot of salted water to a boil - add penne and cook al dente. 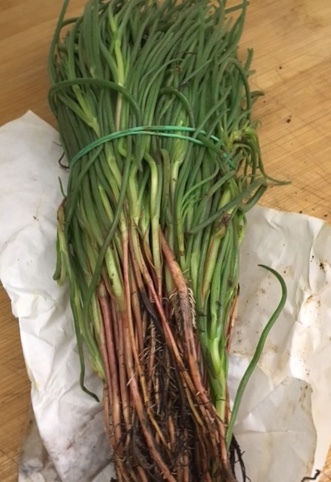 Meanwhile, rinse agretti well, remove roots and lower stems, rough chop into strands about 2 inches long. Heat 1 Tablespoon of olive oil in a sauté pan, add pancetta and cook over medium heat until cooked through but not crisp. Add cleaned and chopped agretti. Cook until softened, stirring from time to time. This shouldn’t take more than about 10 minutes over medium low heat. Drain the penne pasta and return to the pot. Add the lemon juice, 1 Tablespoon olive oil, and the pancetta / agretti mixture and give it a stir. Add the grated Parmesan and toss. Serve immediately with more grated Parmesan on the side. How many pasta shapes can you name? Spaghetti, linguine, tagliatelle, fettucine, farfalle, pici, pappardelle, fusilli, lasagna, and orzo all come to mind - and those are just some of the many solid pasta forms. In Italy, there is a seemingly endless variety of shapes and sizes of pasta. One shape that is found in northern Italy, especially in Liguria, is trofie. I was less familiar with this type of pasta, but recently encountered it at a market in Porto Venere. When I saw it again a few days later in a restaurant in Lucca I couldn't pass up the opportunity to try it. Trofie is a simple eggless pasta, made with just three ingredients - flour, salt, and water. After mixing, a little kneading, and a short rest, the dough is rolled into long thin strands (as if making pici) and then cut into smaller pieces. It's the shaping of these small bits of dough that is key to making trofie. Each small piece is rolled between the palms of the hand in a downward motion, allowing them to fall off the end of the hands (picture a good Ligurian cook doing this in one very quick motion). This gives them their characteristic shape - short thin twists of pasta, a bit thicker in the middle and tapered at the ends. Trofie are best when fatto a mano (made by hand). The commercial varieties have a more structured twist to them, and are more dense than the lighter, roughly shaped hand-rolled ones. In Liguria, it is typical to top trofie with pesto (another local Ligurian specialty). In Lucca, my lunch was trofie with tonno (tuna), fiori di zucca (squash blossoms), pomodoro (tomato) and pan grattato (toasted bread crumbs) . It was a light and tasty dish, perfect with a glass of local vino bianco di Montecarlo (white wine from the Montecarlo region). Delizioso!